I was really proud to have accomplished one of my biggest goals for the year of 2015, which was to finally decorate our home. After living here for three years (now four), I decided it was time to make the changes needed for our home to better reflect our personality and style. And, fortunately, Dave was on board with that plan. 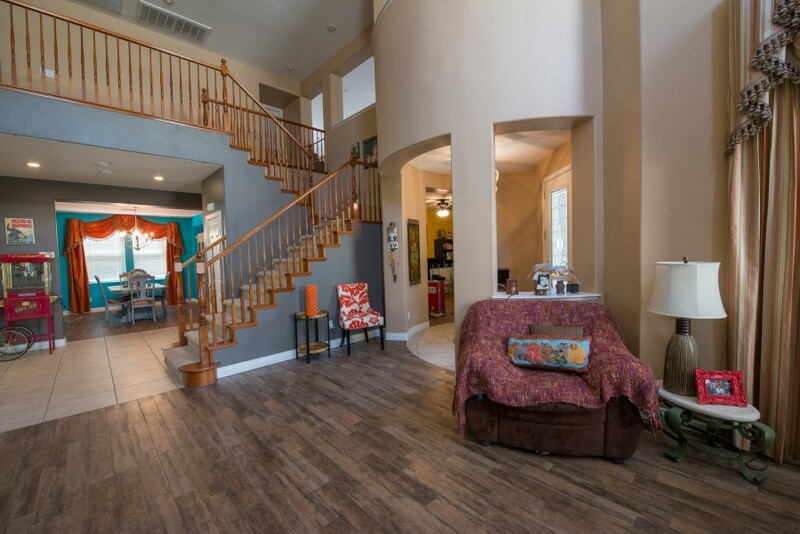 With the exception of new flooring, all of the changes made to our home were incredibly affordable. For the most part, all that was required was some paint, painting tools, Pinterest and an open mind. While our home is very much still in the transformation phase and has a long way to go before our vision is fully realized, I feel that it’s important to embrace where we’re currently at in this process. 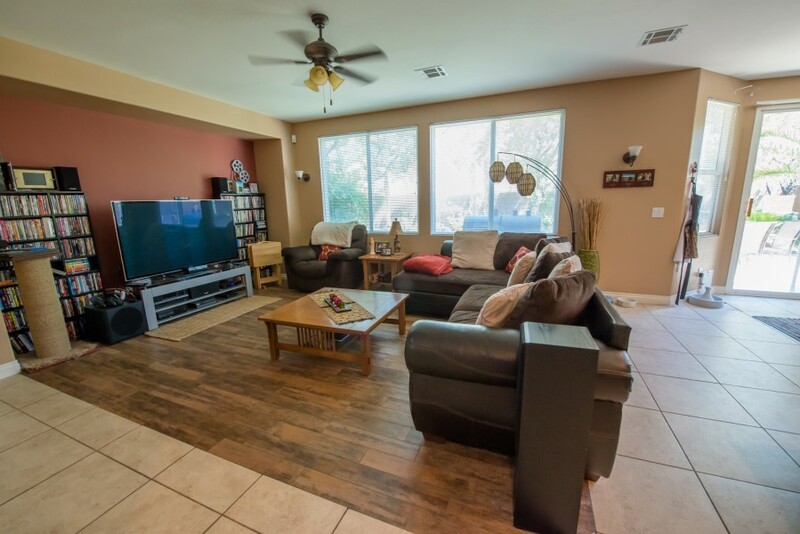 Therefore, I decided to share some photos of what our home looks like today, along with a few tips that may help inspire others with decorating on a budget. Most of these changes were made over the course of the entire year of 2015. #1 – Know your limits. Our Living Room walls were already painted a beige color when we moved in. Considering that those walls are two stories tall, we decided to accept them as is for the time being. (There was just no way in hell that I was going to paint an entire room atop a two-story ladder, so we decided to just keep them as is, and focus on other areas of the home… like the wall beneath our staircase.) This not only simplified our lives, but made decorating on a budget much more achievable. 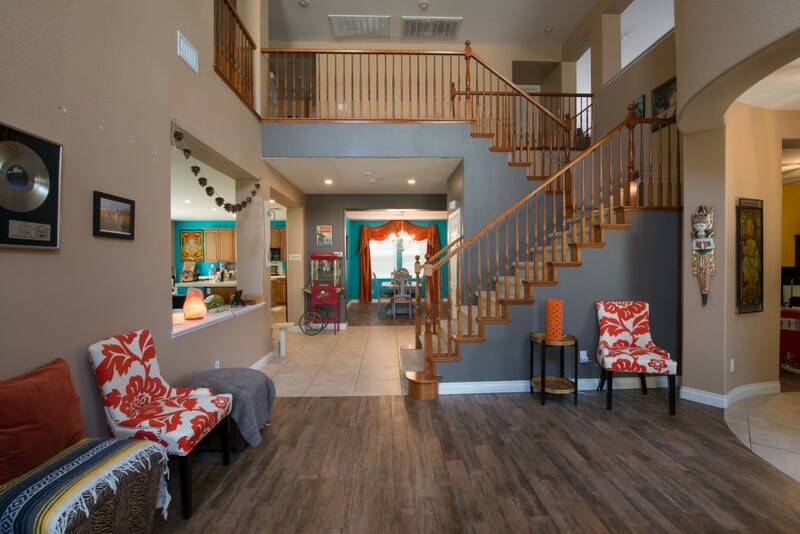 #2 – Focus on accent walls for big impact. 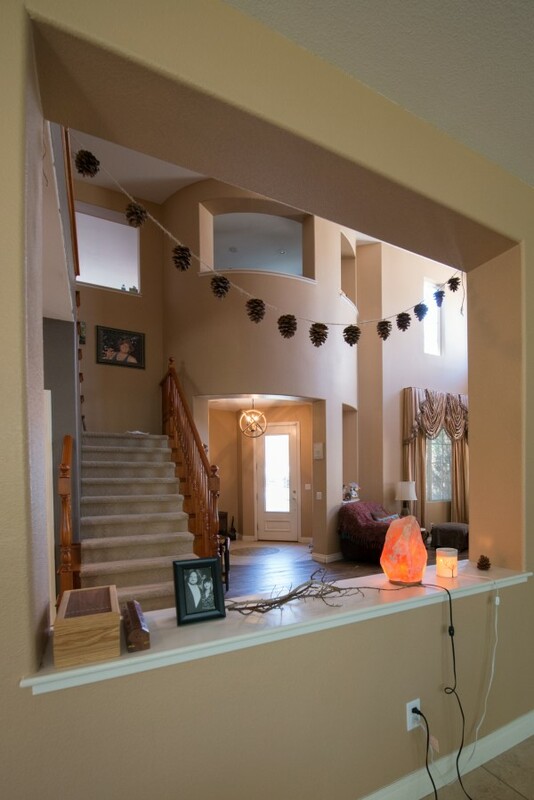 The wall beneath our staircase, and the wall in front of our Dining Room, were perfect areas for accent walls. I selected gray for the color as I figured it would provide a perfect contrast to the beige, while allowing me to have fun, vibrant colors for decor, such as throw pillows, furniture, etc. Decorating on a budget with a bold accent wall. #3 – Replace what’s necessary. 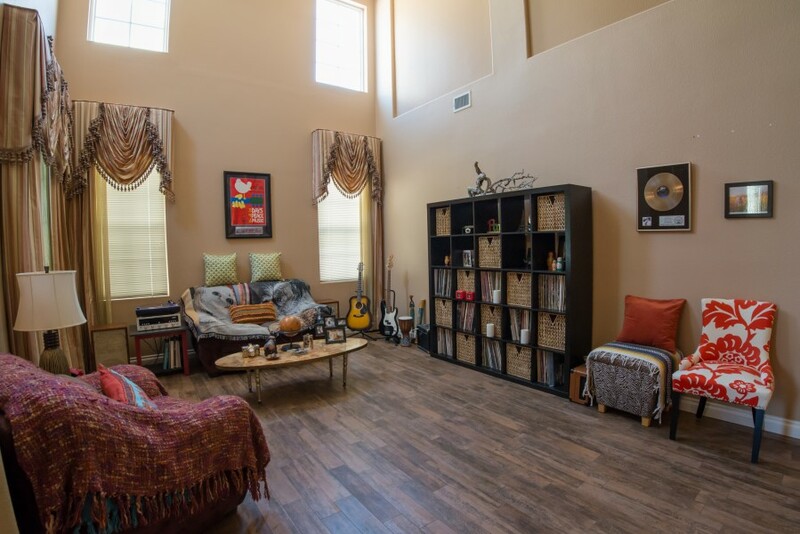 Here in Las Vegas, carpet comes pretty standard in a home, and hardwood flooring is a luxury. Fortunately, we were able to replace our blah, beige carpeting this past fall thanks to a very generous gift from Dave’s mom. It made a huge difference in our home. So much so that I’m not feeling as rushed to replace the curtains in our Living Room (those curtains were the very first thing I’d hoped to eliminate when we first moved in, but they’re starting to grow on me for the time being.) Right now, that’s saving us a lot of money, as two-story drapes would cost a lot to replace. 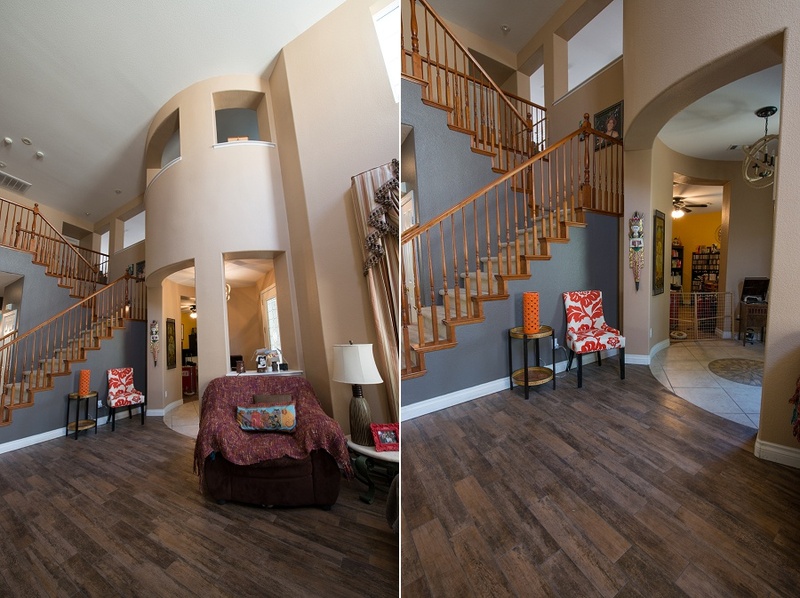 By the way, if you have it in your budget to spend on one big transformation in your home – go with new flooring. If you have carpet in your home, hardwood flooring (or, in our case, tile that looks like wood) will make a HUGE difference. Decorating on a budget by covering ratty, old couch with blanket art. #4 – Use cute blankets to cover holes. And what’s behind this adorable dog blanket? A hole filled couch. A comfy, cozy couch that feels so good to snuggle on with a book, but that’s far too unsightly to ever want anyone to see. A couch that is too budget-friendly (because we already own it, and we don’t have a lot of expendable income at the moment) to get rid of just yet. We figure that it’s at the bottom of our “must replace now” priority list and, for now, it will totally do. In fact, we have grown quite accustomed to it. 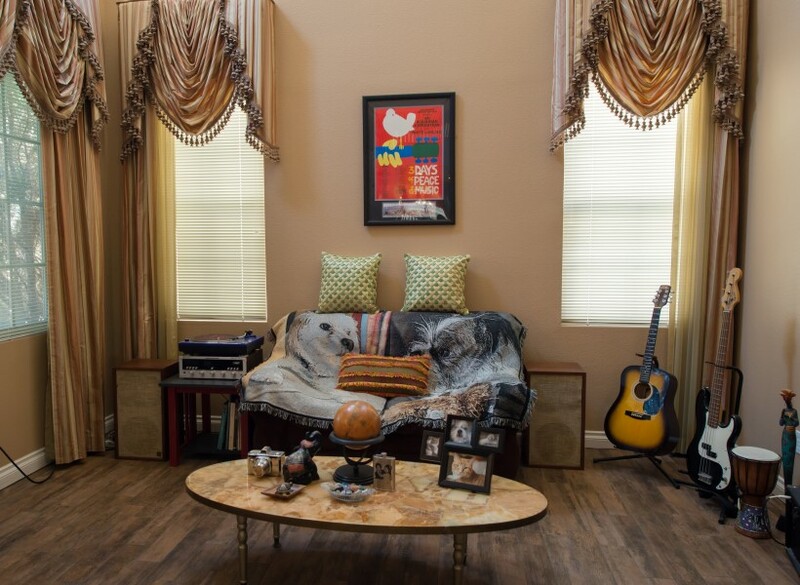 And, really, how many couches will you find with portraits of your fur babies on it? Seriously! (Yes, Dave got me that custom-made gift about six Christmases ago, and used two photos of our dogs. LOVE it!) This is definitely a “decorating on a budget” win! #5 – Find unique pieces that speak to you. You can find these anywhere, from your mom’s storage area to the thrift store, garage sales to even out in nature. #6 – Create your space to enjoy the things you love. The focal point of our Living Room is the record cabinet Dave purchased second-hand two Decembers ago. 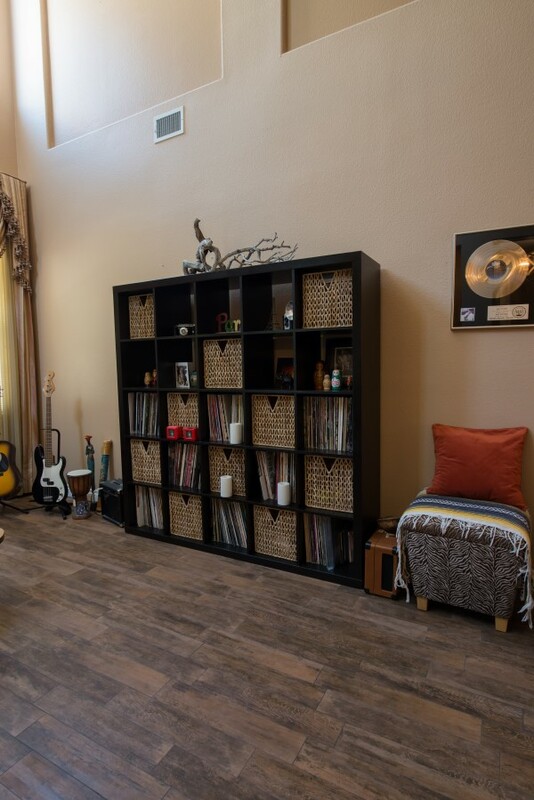 Because music has always been such an essential part of Dave’s life, it was important that he have a place to display the vinyl… and enjoy it. Sitting in our Living Room and just listening to records is now one of our favorite ways of unwinding. Okay, I just told you about the focal point of our Living Room… but I haven’t yet told you about the focal point of our home. 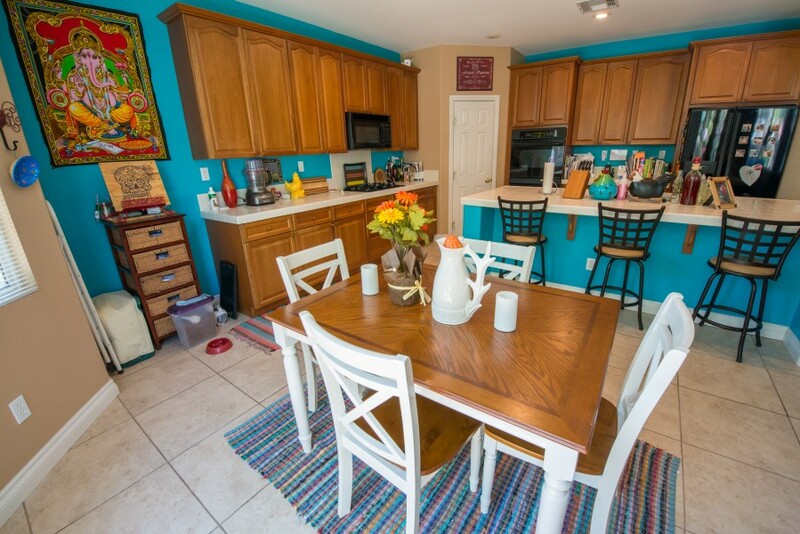 Or, rather points… and those would be the Dining Room and Kitchen, where I LOVE, LOVE, LOVE to spend time. #7 – Select a color that inspires you. 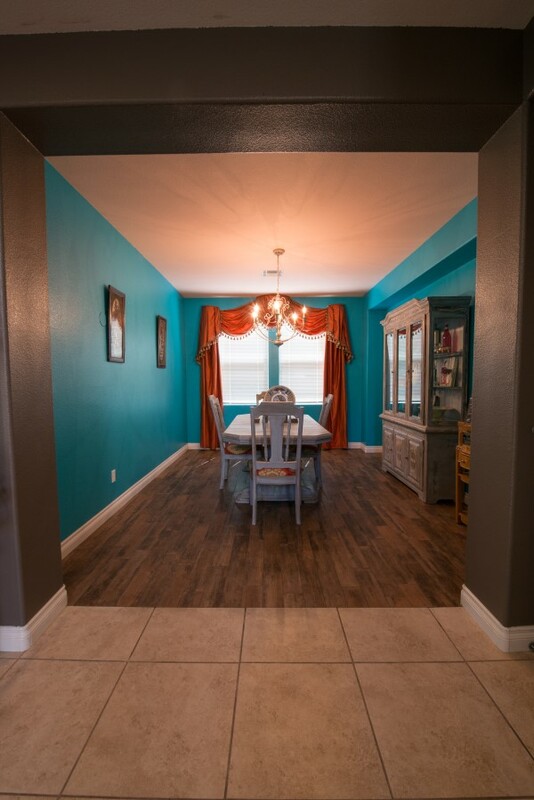 Because I love to cook and entertain, I was pretty excited to paint these two rooms, and I wanted them to be special. Turquoise is one of my absolute favorite colors to wear and decorate with, so, naturally, that’s the shade I gravitated toward. Although the Dining Room and Kitchen are two separate areas of the house, it was important to me that there be some continuity between the two. I decided that I would paint them the exact same color. Now, due to the vastly different lighting in each of those rooms, finding a color that would look good in both was tricky. 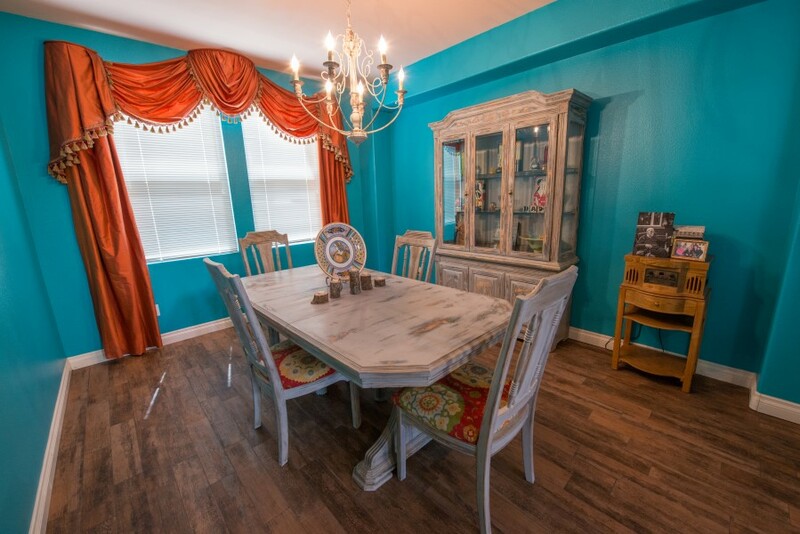 I would have loved to have went with a deeper peacock shade of turquoise; but, unfortunately, that proved to be too dark for the Dining Room. So, I ended up having to go brighter than I wanted to. The final color I selected? Fiji by Behr. 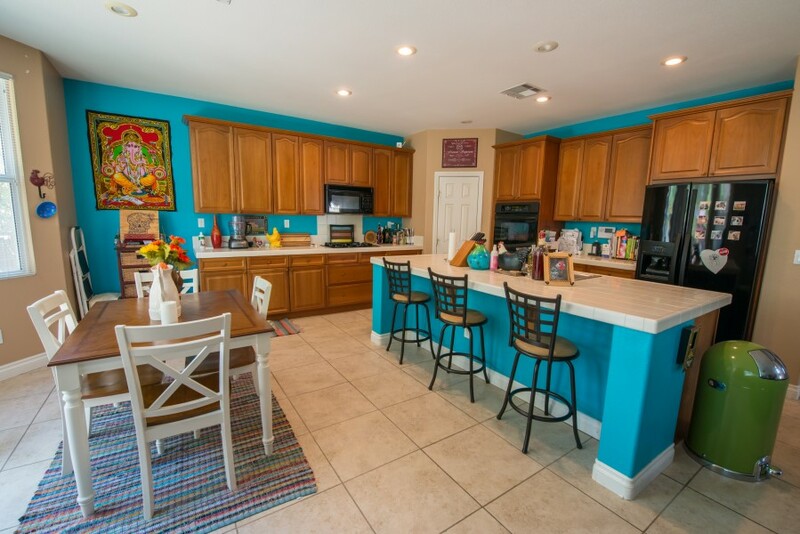 It’s a bright, quirky and fun teal that I’m admittedly still deciding if I like, but that most certainly helps to channel my creative juices when cooking or playing “hostess.” I think that, for now, I’ll live with it. 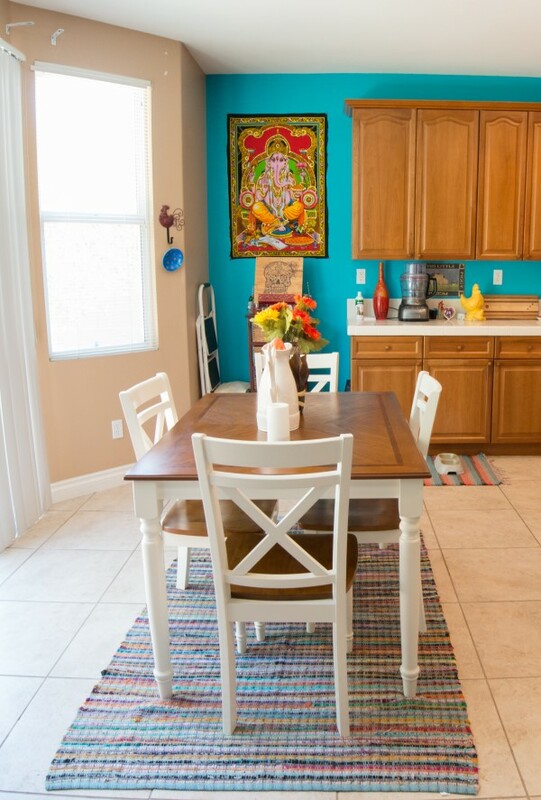 Decorating on a budget with chalk-painted furniture for a whole new look. #8 – Learn a new craft or two. One fun new skill I acquired last year was chalk painting. Notice the finish on my dining set in the photo ABOVE? I, with the help of my mom, transformed the blah dining set into something special using Annie Sloan Chalk Paint. The original finish was a very light colored wood, and we covered that with two different colors of chalk paint – Graphite and Paris Grey – along with the Annie Sloan Dark Wax and Clear Wax. The final product is a three-tone distressed beauty! #9 – Make your space functional. You don’t need to live in a model home. You’re a human. Make your space work for YOU, and not the other way around. For example, having a set of trays in our Family Room enables us to enjoy dinner in front of the television way more often than I would actually like to admit. But, it’s the truth, and it really does make life more convenient. And, that’s where we’re at right now with the transformation of our home. I think we’re doing a decent job at decorating on a budget. I must say that our home is my absolute favorite place to be, and making it beautiful is one of my absolute favorite things to do. I am very blessed.